El universo es dinámico, al igual que Su Creador que es abundante en energía dinámica! Question: Do galaxies produce super-massive black holes…..or do super-massive black holes produce galaxies? It isn’t known which direction that happens in, exactly. However,I like to think of galaxies as the extended accretion disks of black holes. (IE, eventually the accretion disk grows large enough that the disk itself grabs material beyond the easy reach of the black hole, and eventually the extended accretion disk outweighs the central black hole by 2 or 3 orders of magnitude. Then you have a galaxy:). I really like that theory! Good question.. LATELY there seems to be some evidence black holes come first! But like all theory, depends on which data sets you look at…? Newly found halo’s of high energy gamma rays on either pole of the Milky Way come to mind here. Gamma rays are formed only by the highest level energy events, like during anti matter annihilation. We have assumed all matter formed shortly after the ‘Big Bang’ and the universe was predisposed toward making matter over anti matter which has ‘settled out’. Well… maybe it’s time to re-evaluate that assumption? How much gumption is there left to chew? On-going nucleosynthesis seems to fit? Singularities within all black holes? rotating or not? Are we, after all is said and done, mere ‘shadow play’ of larger realities? ACK! Go figure…. Since time would not exist inside the singularity, once the black hole forms it will be there forever and will have always been there. Hawking radiation is emitted at the event horizon. Well, yes, but what does <a href=”https://en.wikipedia.org/wiki/Hawking_radiation#Black_hole_evaporation”evaporation of black hole” means in this case? Is there “something” left behind? And what about <a href=”https://en.wikipedia.org/wiki/Heat_death_of_the_universe#Black_hole_evaporation”universe heat death” scenario if there are naked singularities still flying around? I believe the singularities lead to white holes (via wormholes), and since time doesn’t exist there, the white holes are all back at a point 13.772 years before present. Once all matter has been absorbed through singularities in the far distant ‘future’ it will all have been transported back to the beginning (big bang). It is a continuous loop. I believe that time for all matter (and energy as I understand) to be absorbed by singularities would be like 10^666^666^666 * 3,5. Just imagine that very last photon scattering around hugely expanded universe trying to find its infinity well… 😉 Doesn’t sound like mainstream physics to me (I’m ignorant, though), but I’m sure there is a lot of observational and experimental data to support those theories. There is no clear answer to this question. I think the opinion, and unfortunately this does come down to largely opinion, is that black holes were first. They were probably formed from the explosion or supernova like events from early popIII stars. However, there are problems with trying to figure out how these black holes quickly grow from maybe a few 10s or 100s of solar masses into millions or maybe billions of solar mass behemoths within a few hundred million years. It is hard in a way to get matter into a black hole. For a free black hole without lots of stuff around it you have to shoot a particle pretty directly into it to get it to fall in. Otherwise the particle just goes into an orbit around it. If you do have lots of matter around a black hole, the implosion of this matter is facilitated by friction or hydrodynamic drag effects. However, the heating up of this material tends to force most of the matter away. 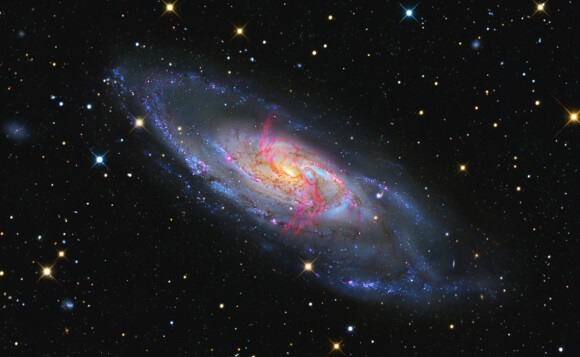 Think of the spectacular jets of matter flying out from the centers of galaxies is SMBHs. So there are a range of unanswered astrophysical problems. do all galaxies rotate counter-clockwise? why? Great article ! One technical comment – I think M106 is twenty four million light years away, not four.